Dazzle them with a colorful batch of Mosaic Glazed Sugar Cookies this holiday season. Made with cream cheese, these Mosaic Glazed Sugar Cookies are moist and chewy and perfect for the dessert table or cookie exchanges. Beat first 4 ingredients in large bowl with mixer until blended. Add flour and baking soda; mix well. Refrigerate 30 min. Heat oven to 375ºF. Roll dough to 1/8-inch thickness on floured surface. Cut into shapes with 3-inch cutters. Place on baking sheets sprayed with cooking spray. Bake 10 min. or until edges are lightly browned. Cool 3 min. ; remove to wire racks. Cool completely. Meanwhile, beat powdered sugar, milk and corn syrup until blended. Spoon 3/4 of the icing into resealable plastic bag; seal bag. Spoon remaining icing into 2 resealable plastic bags; tint icing in one bag with 1/4 tsp. red food coloring, then tint remaining icing with 1/4 tsp. green food coloring. Snip small corner from bottom of each bag. 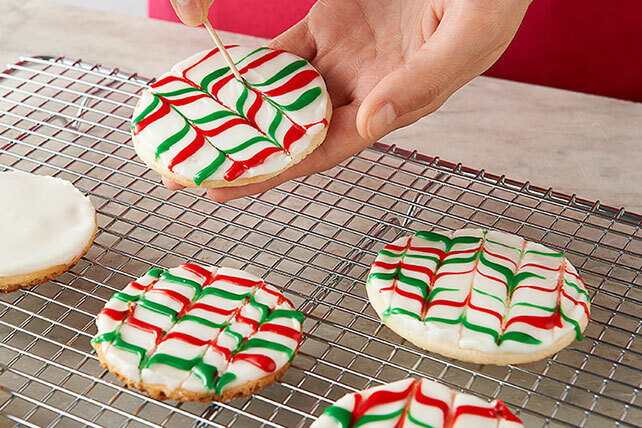 Pipe plain icing onto cookies, then pipe red and green icings into stripes on cookies. Swirl with toothpick.